The Copic Multiliner is a disposable, pigment-based inking pen. The ink is waterproof and archival, and compatible with the popular Copic Markers. Drawings made using Copic Multiliner Pens can be colored with Copic Markers without smearing or smudging the line drawing. You can also use them for drawings that will be finished with watercolor. The disposable pens come in 2 black sets, or in colors in 4 tips sizes. These ink pens are great for details, fine art, design, comics, modeling, sketchbooking and paper crafting. The brush pens have flexible nibs and work just like a brush that has been dipped into black ink. You can get very fine lines broad strokes and painterly marks with the brush pens. 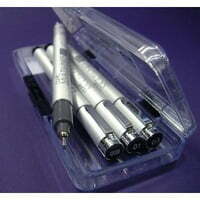 Black Set A-2 (7 pens) – contains 7 standard sizes (0.03 mm, 0.05 mm, 0.1 mm, 0.3 mm, 0.5 mm, 0.8 mm and 1.0 mm). Colors: sepia, wine, olive, cobalt and gray – these are each available in 0.05 mm, 0.1 mm, 0.3 mm, 0.5 mm tips. The Copic MultilinerSP‘s are high quality, aluminum body refillable cartridge pens with replaceable nibs. The ink is pigment-based, waterproof and archival, and compatible with the popular Copic Markers. Architects, designers, illustrators and sketch artists love these long-lasting inking pens. They provide professional quality together with longevity. Black SP’s come in 10-piece and 4-piece kits. Color SP’s come in 12-piece and 4-piece kits, and each kit is available either with 0.3 mm tips, or small brush tips. Check out the other pages under TIPS & TOOLS at the top of the page. There are recommendations if you want to add colored ink to your Zentangle-inspired art, or watercolor, as well as ideas for strings, and much more to come. And if you have information to share on Copic pens, or any other pens you enjoy using with your Zentangles, or tips on their use, please leave a comment or email me (linda AT tanglepatterns DOT com] and let me know so I can add them to this resource for everyone’s enjoyment. Thanks! Re: pens. Personally I do NOT like Sakura Microns. Nibs bend over easily. I haven’t done that but a friend did in no time. I prefer Staedtler pens instead. Ink seems to flow better and I like the nibs. However, the very BEST are COPIC SP’s. The tips seem virtually indestructible. I much prefer that firmer feel when drawing with them. A series of reviews at DickBlick.com emphasized that quality feel when drawing with them. I found the throw away Multiliners did not have the same feel and they run out of ink fairly rapidly. Not so with the SP’s. Please feel free to use whatever part of this you think might be helpful to other ‘tanglers’ out there! I’m with Marcia — I’ve had terrible luck with Sakura Microns in the past. When I started Zentangling, I reached for what I had, which is both the Copic Multiliner and MultilinerSP. While the SPs may be a bit more costly at the start, the nibs and ink are replaceable, giving then pen body a far longer life than many pens out there. The ink is also waterproof and Copic-proof, should one ever decide to tint a tangle. Anyway, that’s my two cents! I am a newer “zentangler.” Just a few weeks. I have to say I love the Sakura Microns. I use .005, .01 and 1. I have them in black and in sepia. Last night I came across my Copic SP….and didn’t like it at all in comparison. I guess…to each her own! The only thing is that I have done watercolor and sketching with the Sakura and they bleed when I added the water color. But when I used the copic multiliners they did not bleed. I like both the sakura and the copic. I just have to remember that when I am doing watercolor with the tangles or any other type of art, where I am also drawing a line before water-coloring, I need to use the copics. I was a draftsman back before computers took over and I wish we had had the Micron pens back then. I used Staedtler technical pens. They were expensive and could get messy since you had to fill them with India ink. They tended to clog frequently, necessitating a complete soaking/cleaning process. The Micron pens completely eliminate all of that. They last a long time, give a consistent line and are just a pleasure to use. I have had none of the problems others speak of. The Sakura Micron color pens don’t cause any bleeding of the black line drawings when adding color. I am going to try the Copic pens as well as more modern technical pens, but I doubt I will completely replace the Microns.